Assuming the stained area was not completely restored through Spot Removal, the stain can go through Re-Dyeing as the next step of the Stain Removal process. Re-Dyeing is the process of manually re-painting each knot with the proper dye in order to restore it to its original color. Persian & Oriental Rug Repair And Rug Re-Dyeing is our specialty! 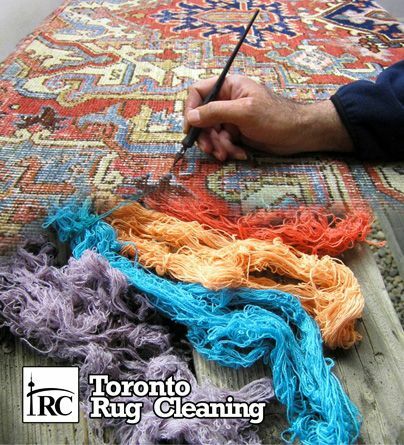 Toronto Rug Cleaning is the foremost leader in the Canada for performing intricately detailed color restorations on Persian & Oriental Rugs. Persian Rugs tend to be very susceptible to damages from sun fading. Toronto Rug Cleaning is able to fully correct this condition. We utilize custom equipment that we specifically developed for this fascinating art. We have restored hundreds of valuable Persian and Oriental Wool & Silk rugs.let us have your rug look beautiful in a timely and reasonably prices fashion. Call us today to find out more. Rug or Carpets that have faded from sun light or chemical exposure may be restored back to their original color through the expert color restoration services of Toronto Rug Cleaning. Dyes are guaranteed permanent and colorfast, and freshly-dyed your Persian or Oriental Rug may be walked on immediately. Our process is environmentally friendly and non-toxic.